As the Charleston, SC cabinetmaker, Martin Pfeninger, relayed to subscribers in his 1773 newspaper announcement “INLAID-WORK in any taste”. Pfeninger is credited with making the Holmes-Edwards library bookcase at the Heward-Washington House. If you are interested in inlaid work- in any taste; whether historic, contemporary, or anything in between.This should be of interest to you. Future posts will be comparative studies of specific styles, subjects, and materials. Regional traditions, inlay makers, distribution, how inlay is made, and restorations will also be explored. Many will recognize this inlay panel. I have carried it with me for many years and pull it out when people ask what I do. It has much more impact that just saying “I make and restore inlay”. The panel is a reproduction from a pair of antique card tables with one missing the panel. The colors came out too bright so I diluted the dyes and made another one that did match the original. A friend once told me “That is the best mistake you ever made.” I would have to agree. 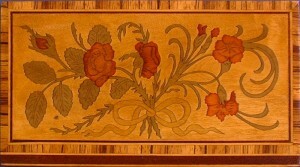 The center section of the panel is made from 1/16″ holly veneer. The design is cut out, just like a jigsaw puzzle, with a jewelers fret saw. 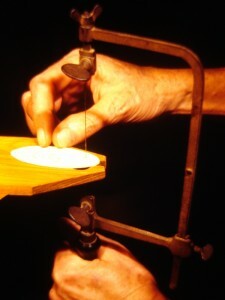 It is similar to a coping saw but with a finer blade. At .009″ (9 thousands of an inch); the blade is about the same thickness as a heavy business card. As you would expect; the blades break very easily. After cutting all of them out; the pieces are placed in their respective dye baths. Red in red dye; green in green dye; and yellow in yellow dye. The dyes are the same as used to color textiles. 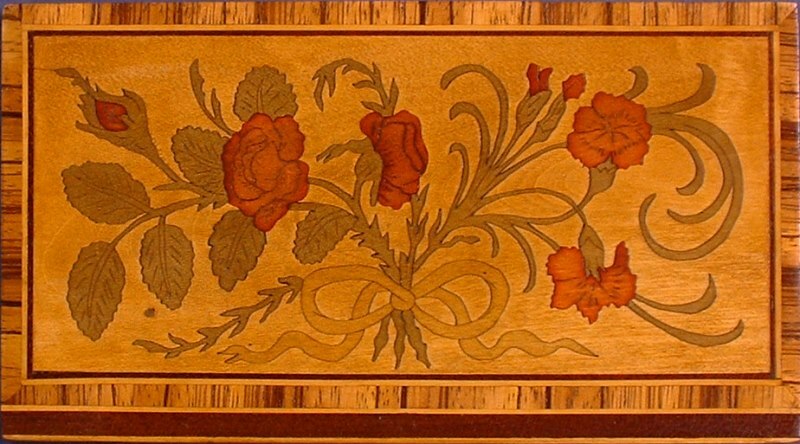 Most inlay with dyed colors is made from holly wood. I will have more on the dye process in future posts. After drying; the pieces are re-assembled and a water soluble paper tape is applied to the front to hold the pieces together. The tape is removed later before leveling the surface and applying the finish. 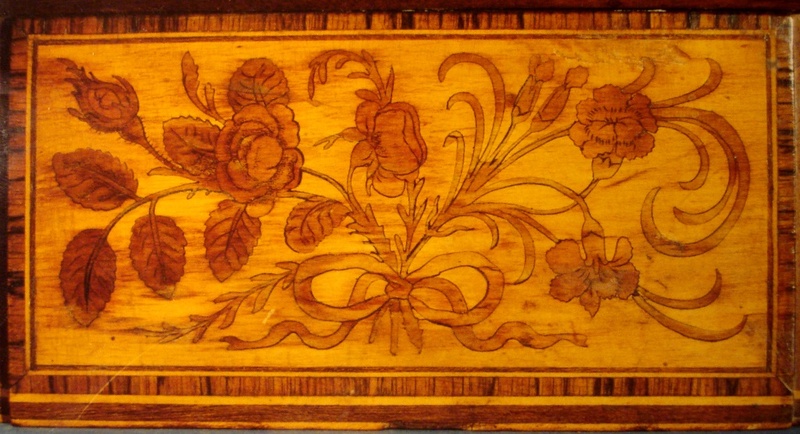 The original panel was raised above the surface of the table skirt with a thin piece of mahogany. The re-assembled veneer is glued to a piece of mahogany. Double holly stringing surrounds the veneer. The dark stringing is dyed holly. Cross-banded zebra wood and the outer double stringing complete the panel. The mahogany with holly stringing at the bottom mimics the skirt inlay on the table. 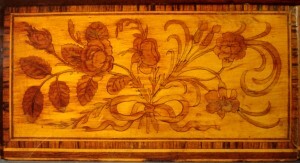 The original panel on one of the card tables; as it came to the shop. A degraded surface obscured the actual color and details. All are welcome to contribute on this subject. If you have some inlay images or information about inlay; post it here or you can contact me russellbuskirk@gmail.com. If you have any questions about inlay or just want to see some specific designs, categories, or subjects; post in the comments and I’ll do my best to include them in my future posts. Any links to inlay related sites, books, or articles are also welcome. Please share your questions, comments, stories, and images of inlay.